We’d love your help. 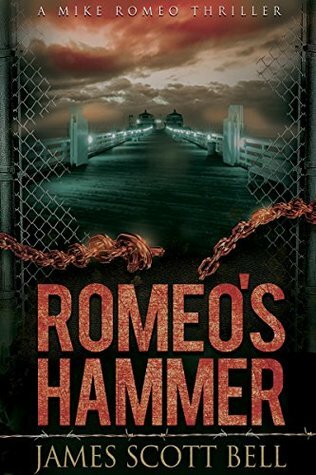 Let us know what’s wrong with this preview of Romeo's Hammer by James Scott Bell. Mike Romeo finds her in the fog, on the beach, staggering around like a drunk. But it's not alcohol that's in her — it's poison. After getting this mysterious woman to the hospital, Romeo figures that's the end of the matter. When the woman goes missing, Romeo is hired by her father to find her. But the trail grows cold, the circumstances strange. The people involved with her are a mix of L.A. odd and downright dangerous. There's a washed-up Hollywood star hoping for a comeback; hired muscle willing to break bones just for the workout; a fight manager with underworld connections; and a strange cult predicting the return of angels to the earth. And some very bad people who want Romeo dead. To ask other readers questions about Romeo's Hammer, please sign up. The main character is filled with an Intriguing mixture of literary references, philosophical musings, and vigilante justice. His “inner voice” is funny, and occasionally endearing. The situations he gets into are often violent, but he generally avoids starting fights. The story is a bit too tragic for my tastes, but it was a great story overall. Very good book. I really like the way this author writes and draws his characters. There is a great deal of humor mixed in. A woman is on the beach definitely high on something. Romeo is enlisted to find out what really happened. Mike Romeo, on a beach, in fog, finds a naked girl. She's dying. He gets her to a hospital. The girl's father hires Romeo to find his daughter. Romeo is an interesting character, with a sharp wit. From the beaches of Malibu to the corners of L.A., more interesting characters are introduced. That includes a strange cult predicting the return of angels to the earth. I loved the biblical references in the story. Not in any way religious. Exciting plot, all the way to the end Mike Romeo, on a beach, in fog, finds a naked girl. She's dying. He gets her to a hospital. You know those books where you are loving it so much that you don’t want it to be over, but you can’t stop reading it anyway? Those are the Mike Romeo books for me. The intellect, the wit, the dialogue, it’s all there. I don’t know why someone hasn’t snapped this up to make it into a television or movie hit, but they’re missing the boat. When it does become a movie, please for the love of all that is good don’t cast Nicole Kidman‘s ex as Mike. Continues in his adventures and we learn more of the past of this genius who went to Yale at age 14, but didn't graduate. As usual, Mike gets beat up, throws a few of his own punches, and manages to partially foil a dastardly plot, and as usual there are a few twists. Waiting for the next booj! I read all 3 books. When I read the 1st book I knew I was going to read them back to back. Excellent story,great characters, and the humor was right down my ally. Mr. Bell you will b one of my very top authors. This series is getting better. Romeo is slowly making some good connections that I'm hoping show up in the next book. For a man with only one friend he meets several potential additional one. I love Mike Romeo. I have had to check the meanings of some words because of his intelligence. Which is a good thing. I like how James Scott Bell has developed his character with each book. I cannot wait for the next one.. Very good. James Scott Bell has always been one of my favorite authors. This is a good story...kind of unbelievable in what he endures and accomplishes though but I did enjoy it a lot. The story, the pace, and the twists make this novel an excellent choice for anyone who wants a great read. Kudos to Mr. Bell for this one. Mike Romeo is a hit with me. Mr. Bell is a great storyteller. This was another winner. Keep em coming. Thoroughly enjoy this author, his characters, his wit, his writing style and story development. I was hooked with the 1st of the series but wanted to insure it wasn't a fluke before I commented. I am now eagerly looking forward to #4. His character Romeo is much like Jack Reacher in his appeal.